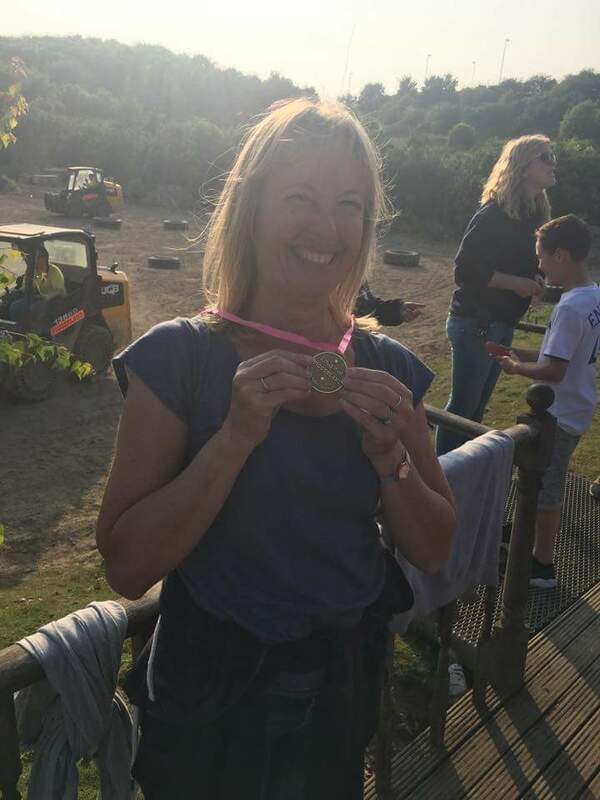 This is not my usual writerly blog post but I think it's nice sometimes to break away and talk about something else... in this case dumper truck racing! We bought this as a Christmas present for the (adult) children and it took place at Diggerland in Kent and we had to drive one of these beasties. There were about thirty of us with four people in each heat. Alongside me in my heat was my step-daughter and two boy racers! Here's us lining up for the start. What I can tell you, is it was NOT easy! The controls were really sensitive and the dumper truck seemed to go every way except the way I wanted to go. Also, my helmet was so big it kept falling over my eyes (maybe I can use that as an excuse for going the wrong way). We had three heats with a variety of tasks (most of which involved weaving through tires or reversing). I did both these things but not necessarily in the right places... as the video shows! I was relieved when we finished - and so were my opponents (they considered themselves lucky to still be in one piece after racing against me). 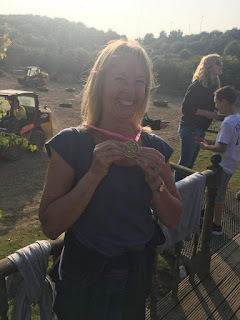 I was going to make this a post about how being out of your comfort zone can be good for your creativity (or something along those lines) but, you know what, I'm just going to leave this as it is, in the hope that you'll enjoy seeing another side to the author me. I'm now off to write a short story about it. If you're thinking this blog post is going to be all about food... then you're probably right. I love food and what better place to eat it than in Italy. We've been gallivanting again - this time to Sorrento and then on to Positano on the Amalfi Coast. This is a picture of the breakfast room in our hotel in Sorrento. We stayed three days and the hotel was very quiet as it was still early in the season. We never saw anyone else at breakfast and it would have been rude not to have tried a bit of everything, wouldn't it? Our room looked out onto a lovely little square with a church on the corner. The balcony was a great place to watch the wedding that took place there on our first morning. While we were in Sorrento, we visited Capri, Pompeii and Herculaneum. What fabulous places. We also ate gorgeous food like the gnocchi and clams below. Hmm... it's making my mouth water just remembering it! We then spent four nights on the Amalfi Coast, staying in the gorgeous town of Positano. As you can see, it is built on a steep terraced hillside - all narrow streets and many, many steps. We were staying right at the top of the village so every day we had to walk back up the hill. The view over the rooftops to the sea was stunning but we certainly felt our calf muscles by the end of the holiday. We visited the charming village of Ravello and the town of Amalfi, whose cathedral (and especially the crypt) was so richly decorated it took our breath away. While I was away, I missed Bonnie. Luckily the bed and breakfast's resident dog Dylan was on hand for a cuddle. it was something I overheard on the beach in Positano. Before I do that though, I have a novel in need of some serious edits so I'll sign off now. Today, I am delighted to welcome Elaine Everest to my blog. Elaine's novel, The Woolworths Girls, was published by Pan Macmillan on 5 May and I decided to find out a little more about it. How long did it take you to write The Woolworths Girls? Thank you for inviting me to your blog, Wendy. It took around nine months. The Woolworths Girls (it had a different working title at that time) was taken to my agent, Caroline Sheldon, as a few ideas on one sheet of paper. We discussed my previous writing and Caroline signed me up at that point and I started to write the book. With three chapters and a synopsis she secured me a two book contract with Pan Macmillan – and a deadline. I feel very fortunate to have such a lovely agent and publisher. I think they are the best - but then I would! I’d already written a novel set in my hometown before the idea for The Woolworths Girls popped into my head. I wanted to keep my sagas in the area of North West Kent where I was born, grew up and knew so much of the local history. I felt it was ‘my patch’ and once I had my character in my head I knew she needed a job – where else but the very Woolworths where I shopped since an early age. Your first novel, Gracie’s War, was also set during the second world war. What is it that attracts you to this era? The romance of war and men in uniform! The uncertainty of a future for couples and knowing one had to live for today is always very much in my mind. Saying that, I hate to kill off my characters and wept buckets when it happened in The Woolworths Girls. I remember going to Woolworths with my mum for a bag of Pick ‘n’ Mix. Do you have your own memories of this shop? I have many memories of Erith Woolworths, where my book is set. It is as much a character in the story as my girls. Mum bought my first bra in Woolies – white with embroidered cherries – I can still feel the embarrassment of wearing it to school and changing for PE. My younger sister and I also shopped at Woolies for our parents' Christmas presents. It was a safe walk from where we lived and we would often go to Woolies after our ballroom dancing lessons in the town where we were taught by Len Goodman’s in-laws. Which of the Woolworths Girls’ characters is your favourite and why? I like them all and tend to change my mind. I like a woman who has struggled in her lifetime and at the moment that would be young Freda who ran away from the Midlands to look for her brother who has escaped from prison. Fortunately she went to work in Woolies and made friends with Sarah and Maisie who took her under their wing from day one. 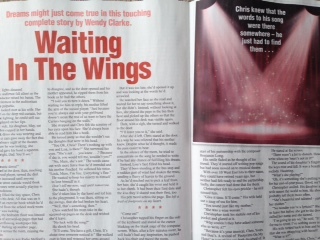 Knowing that I was with a large publishing house and so many people had great hopes for my story. I still feel that way. 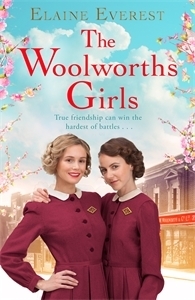 As for writing the novel – I loved it and I will always have a special place in my heart for The Woolworths Girls. Can you describe the moment you heard The Woolworths Girls had been sold to Pan MacMillan? I was at a funeral. Looking back it feels a little like a movie where a character has to keep dashing from the room to take phone calls. Someone asked what I was doing and it felt so pretentious to say, ‘it’s my agent,’ but I couldn’t think of anything else to say. Then, when I rang Caroline she was in a meeting… Its very hard trying not to wear a big grin on one’s face whilst at a funeral wake. Such a long afternoon but at least I’ll remember it! Do you think being a member of the Romantic Novelists’ Association helped you on your path to publication? Most certainly. Even though I was a working writer with short stories, articles, and three non fiction books under my belt as well as many charity anthologies I joined the RNA as a member of it’s New Writers’ Scheme. When I graduated with Gracie’s War I was a contender for the Joan Hessayon Award in the year there were fifteen of us. I met my agent via the RNA so will always be a big supporter of the Association. What next for Elaine Everest? Gosh! So much is happening at the moment. I feel as though I’ve been interviewed by most women’s magazines and have radio interviews lined up. My next book with Pan Macmillan for 2017, The Butlins Girls, is at the edit stage and as I’ve been working on your questions an email has arrived from my wonderful editor to say cover designs are beginning and asking for my input. I have an outline for my 2018 novel which I’m itching to get started on. Life is very exciting and what I’ve dreamt of for so many years! 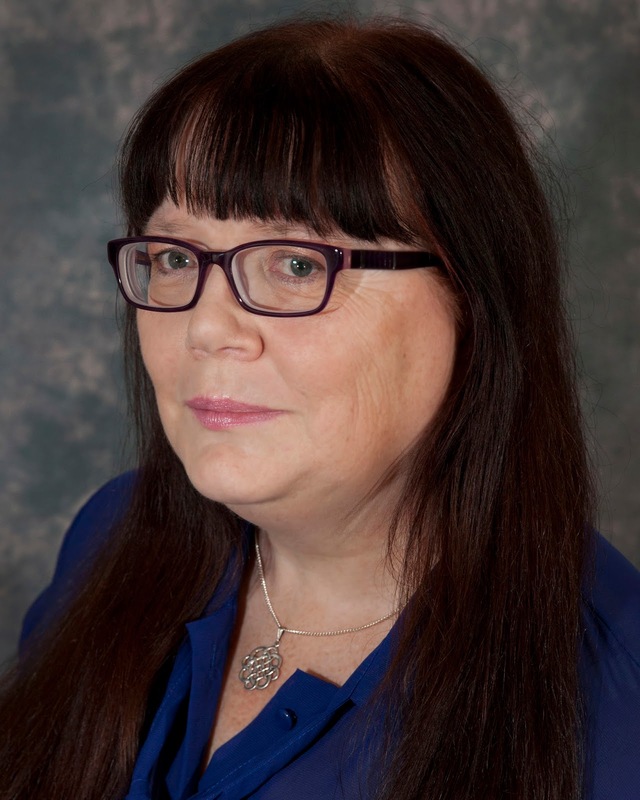 Elaine has written widely for women's magazines, with both short stories and features. When she isn't writing, Elaine runs The Write Place creative writing school in Dartford, Kent, and the blog for the Romantic Novelists' Association.